found this debate over at the TCG side few weeks back and thought that it might be good to share. as i had mentioned, this is only pertaining to TCG, so for official OCG rulings, we still have to wait for the official ruling to be released. Effect: All "gravekeeper's" monsters gain 500 ATK and DEF. Cards in either player's graveyard cannot be removed from play. Cards in either player's Graveyard cannot be affected by card effects, except for their own effects. 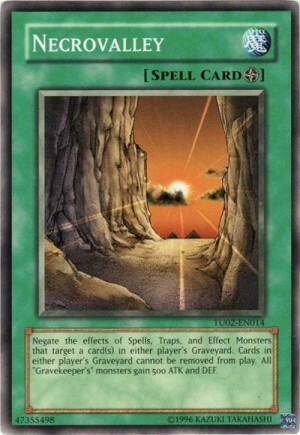 drill warrior would return to the field but could not add a card from the graveyard, and its effect to add a card from the gravyard did not activate, so the last thing to happen is the returning of drill warrior and now you are free to bottomless it. the bottomless part is also consistent with the OCG ruling given at wikia. this ruling kind of makes gravekeeper decks strong, as recycling and reusing materials from the grave is what dandy deck is all about. now, out of a sudden, with necrovalley on field, you cannot take back the monster from grave, and still has the chance to get hit by bottomless makes it worse. and dont forget that -1 that you had discarded for drill to remove it from play. 1. If the activation of the effect of "drill warrior" which Special Summons it during the Standby Phase is negated by the effect of "light and darkness dragon", then you cannot activate that effect of that "drill warrior" a second time during the same Standby Phase. Thus, "drill warrior" remains removed from play. 2. The resolution of "drill warrior" which removes it from play and the resolution which has you discard one card from your hand are considered to occur simultaneously. Thus, if you discard "jinzo-returner" with this effect, then you can Special Summon "jinzo" from the Graveyard.